It's no secret that Andrea Carter would rather ride her beloved palomino, Taffy, than do anything else. Now Taffy's having her first foal, and Andi can't wait to train it to become as good a companion as its mother. The only distraction from those delightful plans is the fear that something may go wrong. When her foaling fears are realized, Andi is grateful for her brother Chad's intervention. It looks like smooth sailing from now on! Unfortunately, life as a teenager might not be all fun and games after all. There's a new girl at school assigned to sit beside Andi--but Macy Walker is nothing like the other girls. She's homeless and ill-bred, and her mistakes do more than make Andi uncomfortable; they put her life in danger. Meanwhile, cattle rustlers have suddenly descended on the Valley and the Circle C ranch is a target. These outlaws mean business--and their business is theft. When the thieves change from stealing cattle to stealing horses, it means heartbreaking loss for Andi. Her unpleasant classmate Macy may hold the key to getting Taffy's foal back. Can Andi trust Macy to do the right thing? Does she have a choice? Picking up the story line of Andrea Carter and the Price of Truth, Thick as Thieves sees Andi growing up just in time for her loyal readers to grow alongside her. The Circle C Milestones series will follow Andi from age 14 to 17, as she begins to tackle the more serious issues facing an older audience and--eventually--discovers love. It's been a while since I've read anything geared towards teenagers, but this book wasn't a disappointment. 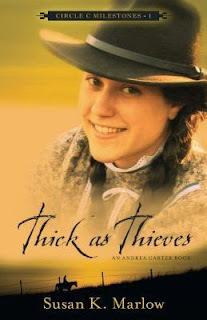 Filled with action, family and some great lessons, Thick as Thieves kept me reading. I remember a time when a book that included horses would have kept me reading well past bedtime and I think if you have a child who loves them, this one could do the same thing. My only complaint is that while this is book 1 in the series, it does come after other books so I did feel a bit lost when it referenced things from the past. All in all though, I think this book is perfect for the tween set, especially if they love horses, adventure and a whole lot of excitement.